Just want to note that the updating of the Japanese SUV is not global, but rather a local one, because Toyota Highlander of 3rd generation is produced only three years and has not had time to grow old. What has changed in the updated version of the popular full-size crossover, able to comfortably accommodate and transport 7-8 people? 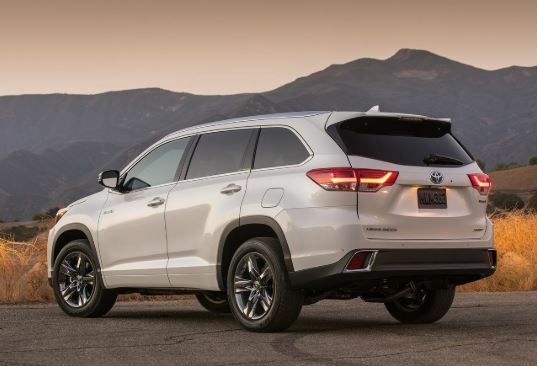 First of all the new Highlander received a completely different front end and a corrected design of the stern, the standard-installed Toyota Safety Sense P safety system, an upgraded 3.5-liter gasoline engine with the latest 8-speed automatic transmission. In front crossover demonstrates strict headlights, complemented by the curves of the LED daytime running lights, a huge trapezium false radiator grille, a modified bumper with neat vertical slots of air ducts and round fog. At the rear of the body are installed upgraded parking lights with LED content and the original 3D graphics. Also it received the new and most expensive SE package: enamel color for Salsa Red Pearl body paint, 19-inch aluminum wheels with 12 knitting needles and 245/55 R19 tires, sport suspension settings, black leather trim with silver stitching, a complete set of modern systems that ensure the comfort and safety of the driver and his companions. In total, six configurations are offered for the crossover – LE, LE Plus, XLE, SE, Limited and Limited Platinum. 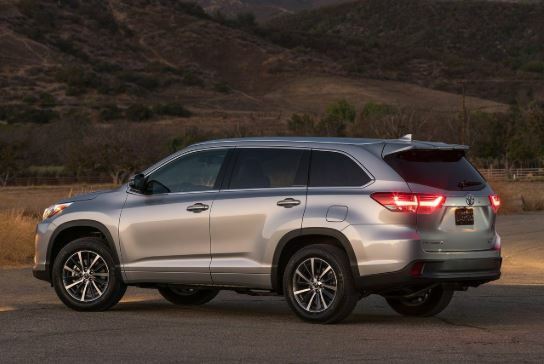 In the cabin of the updated Toyota Highlander, there are no visible changes, if we disregard the proposed new version of the brown leather interior as an option and the presence of as many as 5 ports for USB. Perhaps the most important thing is that all versions of the Toyota Highlander 2017, starting with the basic configuration, are standardly equipped with a modern safety system Toyota Safety Sense P, including a frontal collision avoidance system with automatic braking, systems that monitor the unauthorized crossing of the marking line and objects in the blind zones of the rear-view mirrors, pedestrian detection system, adaptive cruise control, adaptive headlights. As an option, four cameras are offered, providing a circular view and a picture on a car from a bird’s eye view (the system is called the Bird’s Eye View Camera with Perimeter Scan). Under the hood of the crossover, you can install a choice of two gasoline engines and a hybrid power plant for the Toyota Highlander Hybrid. The initial four-cylinder gasoline engine 2.7 VVT-i (185 hp 250 Nm) with 6 automatic transmissions remained the same and is installed only on the basic version of the crossover with front-wheel drive. Most of all we are also interested in a more powerful petrol version with a 3.5-liter V6 and a new 8 automatic transmission (Direct Shift 8-Speed). According to preliminary information, the Japanese minders have upgraded the engine by increasing its power to more than 290 forces and raising torque to 360-370 Nm. At the same time, the new V6 3.5 engine is equipped with a start-stop system, and not without the help of a new gearbox with 8-speeds consumes, in the mixed mode of movement, according to the manufacturer, 9.8 liters of gasoline. Production of the updated Japanese crossover Toyota Highlander 2017 model year had started in May 2016 at the Toyota Motor Manufacturing plant in Princeton (Indiana). The model, by the way, is sold only in 12 countries.